Greenland ( Greenlandic: Kalaallit Nunaat, meaning "Land of the Kalaallit (Greenlanders)"; Danish: Grønland, meaning "Greenland") is a self-governed Danish territory. Though geographically and ethnically an Arctic island nation associated with the continent of North America, politically and historically Greenland is closely tied to Europe. Icelandic settlers found the land uninhabited when they arrived c. 982. They established three settlements near the very southwestern tip of the island, where they thrived for the next few centuries, and then disappeared after over 450 years of habitation. The fjords of the southern part of the island were lush and had a warmer climate at that time, possibly due to what was called the Medieval Warm Period. These remote communities thrived and lived off farming, hunting and trading with the motherland, and when the Scandinavian monarchs converted their domains to Christianity, a bishop was installed in Greenland as well. The settlements seem to have coexisted relatively peacefully with the Inuit, who had migrated southwards from the Arctic islands of North America around 1200. In 1261, Greenland became part of the Kingdom of Norway. Norway in turn entered into the Kalmar Union in 1397 and later the personal union of Denmark-Norway. After almost five hundred years, the Scandinavian settlements simply vanished, possibly due to famine during the fifteenth century in the Little Ice Age, when climatic conditions deteriorated, and contact with Europe was lost. Bones from this late period were found to be in a condition consistent with malnutrition. Some believe the settlers were wiped out by bubonic plague or exterminated by the Inuit. Other historians have speculated that Basque or English pirates or slave traders from the Barbary Coast contributed to the extinction of the Greenlandic communities. Denmark-Norway reasserted its latent claim to the colony in 1721. The island's ties with Norway were severed by the Treaty of Kiel of 1814, through which Sweden gained control over mainland Norway while Denmark retained all of their common overseas possessions, which, at that time, included small territories in India, West Africa and the West Indies, as well as the Faroe Islands, Iceland and Greenland. Norway occupied and claimed parts of (then uninhabited) East Greenland aka Erik the Red's Land in July 1931, claiming that it constituted Terra nullius. Norway and Denmark agreed to settle the matter at the Permanent Court of International Justice in 1933, where Norway lost. During World War II, Greenland's connection to Denmark was severed on April 9, 1940 when Denmark was occupied by Germany, and Greenland was on its own. Through the cryolite from the mine in Ivigtut, Greenland was able to pay for goods bought in the United States and Canada. During the War the system of government changed. Eske Brun was governor and ruled the Island via a 1925 law concerning the governing of the Island where, under extreme circumstances, the governors could take control. The other governor, Aksel Svane, was transferred to the United States as leader of the commission to supply Greenland. The Sirius Patrol, guarding the Northeastern shores of Greenland using dog sleds, detected and destroyed several German weather stations, giving Denmark a better position in the postwar turmoil. Greenland had until 1940 been a protected and thereby isolated society. The Danish government, which governed the colonies of Greenland, had been convinced that the society would face exploitation from the outside world or even extinction if the country was opened up. During World War II, though, Greenland developed a sense of self-reliance during its period of self-government and independent communication with the outside world. However, in 1946 a commission (with the highest Greenlandic council Landsrådet as participant) recommended patience and no radical reformation of the system. Two years later the first step towards an alteration of the governing of Greenland was initiated as a grand commission was founded. In 1950 the report (G-50) was presented. Greenland was to be a modern welfare society with Denmark as the sponsor and example. In 1953 Greenland was made an equal part of the Danish Kingdom. In 1979 home rule was granted. The name Greenland comes from Scandinavian settlers. In the Norse sagas, it is said that Erik the Red was exiled from Iceland for murder. He, along with his extended family and thralls, set out in ships to find the land that was rumored to be to the northwest. After settling there, he named the land Grønland ("Greenland"), possibly in order to attract more people to settle there. Greenland was also called Gruntland ("Ground-land") on early maps. Whether Green is an erroneous transcription of Grunt ("Ground"), which refers to shallow bays, or vice versa, is not known. It should also be noted, however, that the southern portion of Greenland (not covered by glacier) is indeed very green in the summer. There is an on-going diplomatic sovereignty dispute between Canada and Greenland (represented internationally by Denmark) over the tiny Hans Island. Greenland was one of the Norwegian Crown colonies from the eleventh century until 1814. At that time, the Kingdom of Norway and Denmark (the Norwegian King having succeeded to the Danish throne a few centuries earlier; see Denmark-Norway) found itself on the losing side of the Napoleonic Wars. In gratitude to Sweden for her assistance in defeating Napoleon (and as a consolation for the recent loss of Finland to Russia), mainland Norway and certain Norwegian territories were transferred to Sweden — thus, the personal union of Norway and Denmark ended. The crown colonies of Greenland, Iceland and the Faeroe Islands, however, remained part of the reorganised "Kingdom of Denmark." Greenland became an integral part of the Kingdom of Denmark in 1953. It was granted home rule by the Folketing (Danish parliament) in 1978. The law went into effect on May 1, 1979. The Queen of Denmark, Margrethe II, remains Greenland's Head of State. Greenlandic voters subsequently chose to leave the European Economic Community upon achieving self-rule. Greenland's Head of State is the Danish Monarch, currently Margrethe II. The Queen's government in Denmark appoints a Rigsombudsmand ( High commissioner) representing the Danish government and monarchy. Greenland has an elected parliament of thirty-one members. The head of government is the Prime Minister, who is usually the leader of the majority party in Parliament. The current Prime Minister is Hans Enoksen. Greenland is not part of the European Union (having left the predecessor of the EU, the European Community, in 1985), despite Denmark itself being a member state. The total area of Greenland measures 2,166,086 km² (836,109 square miles), of which the Greenland ice sheet covers 1,755,637 km² (677,676 square miles) (81%). The coastline of Greenland is 39,330 km (24,430 miles) long, about the same length as the Earth's circumference at the Equator. The weight of the massive Greenlandic ice cap has depressed the central land area to form a basin lying more than 300 m [1,000 feet] below sea level. 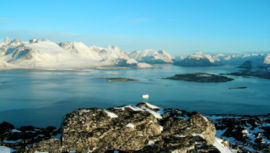 A typical scene from South Greenland, near Nanortalik, where fjords and mountains dominate the landscape. Note the small iceberg in the foreground. The extreme north of Greenland, Peary Land, is not covered by an ice sheet, because the air there is too dry to produce snow, which is essential in the production and maintenance of an ice sheet. If the Greenland ice sheet were to completely melt away, sea levels would rise more than 7 m (23 feet) and Greenland would most likely become an archipelago. Between 1989 and 1993, U.S. and European climate researchers drilled into the summit of Greenland's ice sheet, obtaining a pair of two-mile (3.2 km) long ice cores. Analysis of the layering and chemical composition of the cores has provided a revolutionary new record of climate change in the Northern Hemisphere going back about 100,000 years and illustrated that the world's weather and temperature have often shifted rapidly from one seemingly stable state to another, with worldwide consequences. The glaciers of Greenland are also contributing to global sea level rise at a faster rate than was previously believed. In February 2006, researchers reported that Greenland's glaciers are melting twice as fast as they were five years ago. According to satellite gravity measurements, the annual loss was estimated at 216 km³/yr (52 cubic miles per year) by 2005. Between 1991 and 2006, monitoring of the weather at one location (Swiss Camp) found that the average winter temperature had risen almost 10 degrees Fahrenheit. The American Top of the World expedition found the northernmost island in the world off of Greenland: ATOW1996. Qaanaaq in North West Greenland, is the most northerly place whose name is a palindrome. About 81% of its surface is covered by ice, known as the Greenlandic ice cap, the weight of which has depressed the central land area to form a basin lying more than 300 m [1,000 ft] below the surrounding ocean. Greenland suffered economic contraction in the early 1990s, but since 1993 the economy has improved. The Greenland Home Rule Government (GHRG) has pursued a tight fiscal policy since the late 1980s which has helped create surpluses in the public budget and low inflation. Since 1990, Greenland has registered a foreign trade deficit following the closure of the last remaining lead and zinc mine in 1990. Greenland today is critically dependent on fishing and fish exports; the shrimp fishing industry is by far the largest income earner. Despite resumption of several interesting hydrocarbon and mineral exploration activities, it will take several years before production can materialize. Tourism is the only sector offering any near-term potential and even this is limited due to a short season and high costs. The public sector, including publicly owned enterprises and the municipalities, plays the dominant role in Greenland's economy. About half the government revenues come from grants from the Danish Government, an important supplement to the gross domestic product. GDP per capita is equivalent to that of the weaker economies of Europe. Greenland has a population of 56,361, of whom 87% are Greenlandic, a mixture of Inuit and European races. The majority of the population are Evangelical Lutherans. English, Danish and Greenlandic are all spoken by the population. Nearly all Greenlanders live along the fjords in the south-west of the main island, which has a milder climate. Most Greenlanders have both Kalaallit ( Inuit) and Scandinavian ancestry, and speak Greenlandic (Kalaallisut) as their first language. Greenlandic is spoken by about 50,000 people, which is more than all the other Eskimo-Aleut languages combined. A minority of Danish migrants with no Inuit ancestry speak Danish as their first language. Both languages are official with the West Greenlandic dialect forming the basis of the official form of Greenlandic. The Greenland National Museum and Archives is located in Nuuk. Football is the national sport of Greenland, but Greenland is not a member of FIFA. FIFA rules stipulate that member nations have minimum standard pitches for international games, which mandates natural grass. Greenland's climate prevents natural grass pitches that come up to FIFA Standards. Recently FIFA have announced that they will let teams play on FieldTurf, which could offer a solution to Greenland's pitch problem.